Yes — another post with multiple recipes! Four, to be exact. Though each component would taste fine on its own, I couldn’t put them in separate posts because it’s the combination of all four that really makes the meal. This calls for a new blog category: “full meals,” a category you can click on if you’d rather just open one window in your browser and make a whole meal from that single page. This delightful combination of Middle Eastern-flavored dishes comes from the glorious smitten kitchen cookbook, which I pulled down last week to sort through and mark new recipes for F and me to try. First I took Deb’s advice for how to make granola form clusters. But I also saw this great-looking recipe entitled “roasted eggplant with yogurt-tahini sauce and cumin-crisped chickpeas.” I am an eggplant (aka aubergine here in the UK, or baklazhan if you’re in Ukraine) fan, and F is too, so when we were contemplating Sunday dinner ideas, I showed the recipe to him and we decided to go for it. The recipe suggests sautéing some ground lamb for more meatiness — we liked that idea so F said he’d take it a step further and make lamb meatballs/patties. 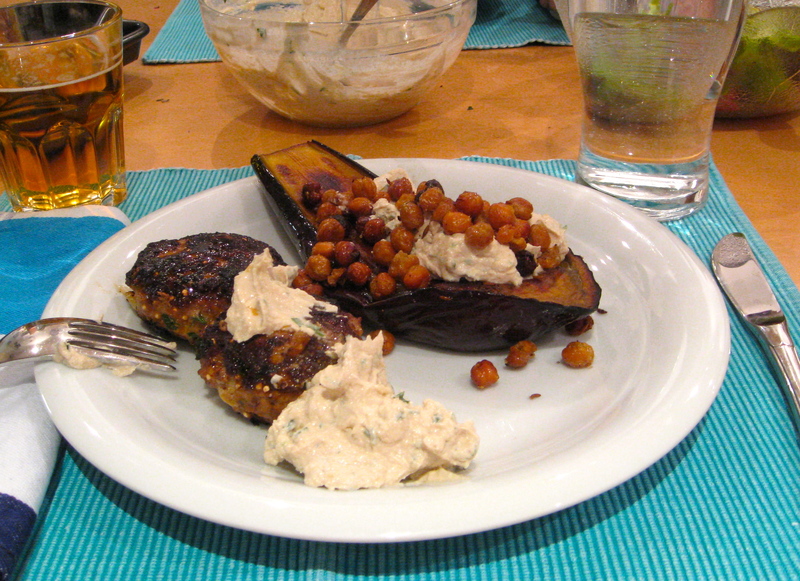 I loved the creaminess of the yogurt-tahini sauce; it complemented the slightly spicy lamb and crispy chickpeas and added nice depth of flavor to the eggplant. I am so looking forward to eating the leftovers. Before we get on to the recipes themselves, one word of advice: you’ll need the oven for both the chickpeas and the eggplant. 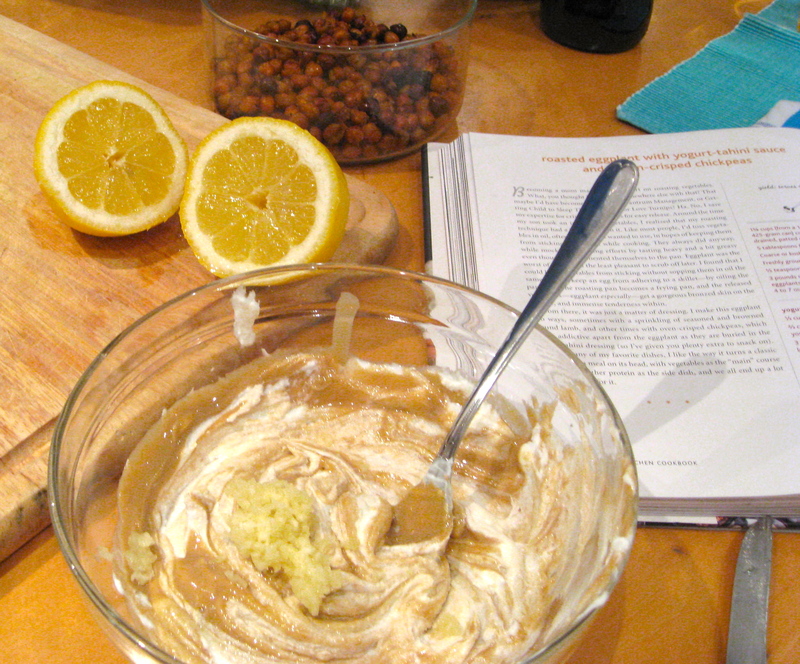 I’d recommend roasting the chickpeas earlier in the day so you’re not stuck in the kitchen for too long before dinner. You could mix up the lamb ingredients while the chickpeas are cooking, then pop it in the fridge until you’re ready to form and fry the meatballs. I’ve separated the recipes so they’re easier to follow; make them in the order they appear, but don’t cook the meatballs until you’ve put the eggplant in the oven. You can of course prepare any one of these separately as a complement to another meal (the sauce would be delicious with falafel or roasted root vegetables). Preheat the oven to 425F (215C). Toss all ingredients together in a bowl. Spread them on a baking sheet and bake for 25-35 minutes, stirring occasionally, until the chickpeas are browned and crispy. When the eggplant goes in the oven, take out the lamb mixture and form smallish patties. Fry the patties in oil over medium heat until browned and cooked through, 5-7 minutes per side. Preheat the oven to 400F (200C). Lightly oil a baking sheet (or just use the pre-oiled sheet that you baked the chickpeas on). Put the eggplant halves flat side up on the baking sheet. Brush the flat sides with olive oil. 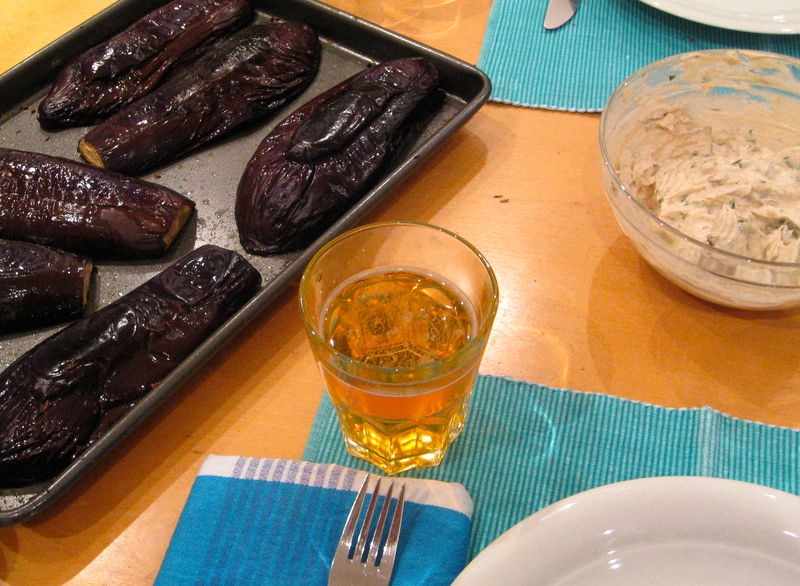 Bake for 10-15 minutes, then carefully flip the eggplants over and bake another 10 minutes. Vigorously mix everything together in a bowl, tasting and adjusting flavors as you prefer. Serve the eggplant and meatballs topped with sauce and sprinkled with chickpeas. This entry was posted in food, full meals, health, pictures, recipes and tagged Middle Eastern on 11.03.2013 by taplatt. Woah, this looks incredible! Can’t wait to make it myself!! : ) Also loving the new category- “full meals”. What a good idea! Thanks! I thought another category would make searching easier. Thanks so much for linking to my recipes!